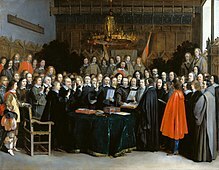 Portrait o "The Ratification o the Treaty o Münster", ane o the treaties leadin tae the Peace o Westphalie, whaur the concept o the "naition state" wis born. A naition state is a geografical aurie that can be identified as derivin its poleetical legitimacy frae servin as a sovereign naition. ↑ Such a definition is a working one: "All attempts to develop terminological consensus around "nation" resulted in failure", concludes Tishkov, Valery (2000). "Forget the 'nation': post-nationalist understanding of nationalism". Ethnic and Racial Studies. 23 (4): 625–650 [p. 627]. doi:10.1080/01419870050033658. . Walker Connor, in [ Connor, Walker (1978). "A Nation is a Nation, is a State, is an Ethnic Group, is a...". Ethnic and Racial Studies. 1 (4): 377–400. doi:10.1080/01419870.1978.9993240. ] discusses the impressions surrounding the chairacters of "nation", "(sovereign) state", "nation state", and "nationalism". Connor, who gave the term "ethnonationalism" wide currency, also discusses the tendency to confuse nation and state and the treatment of all states as if nation states. In Globalization and Belonging, Sheila L. Crouche discusses "The Definitional Dilemma" (pp. 85ff).